A new traffic pattern and work zone has been established at the Toll Plaza. Toll Lanes 11, 12 & 13 are closed for renovations. Please CLICK HERE for graphic. During the weekend of 12/02/16, the ramp to westbound HCE will be realigned. Short duration traffic holds are expected overnight. This work will be supported by State Police. During the weekend of 12/09/16, traffic to and from Port Jersey Boulevard and Route 440 will be shifted from the old bridge onto the new Connector Bridge. During the weekend, from 8:00PM Friday through 4:00PM Sunday, traffic to the Turnpike from Route 440 and Port Jersey Boulevard will be diverted to Interchange 14B. Avenue E traffic will not be impacted. Bayonne and Jersey City Police will support this work. During the weekend of 11/18/16, Toll Lanes 5, 6 and 7 will be reopened and Toll Lanes 11, 12 & 13 will be closed for staged construction. The closure duration for Toll Lanes 11, 12 & 13 is expected to be 12 weeks. Please CLICK HERE for graphic. Begin reconstruction of Toll Lanes 11 & 12. During the week of 12/02/16, 8:00PM Friday through 4:00PM Saturday, asphalt paving will be performed on the ramp to westbound HCE. Short duration traffic holds are expected overnight. This work will be supported by State Police. During the evening of 11/18/16, from 8:00PM Friday to 7:00AM Saturday, the Toll Plaza work zones will change for staged construction. Toll Lanes 5, 6 & 7 will be reopened and Toll Lanes 11, 12 & 13 will be closed. The duration for the closure of Toll Lanes 11, 12 & 13 is 14 weeks. Westbound: Westbound Interchange 14C – 14: Traffic will be reduced to one lane from 9P Friday to 5A Monday between milepost N6.0 – N2.8(Kennedy Blvd.). This closing is necessary to address high priority and emergent bridge deck repairs in the westbound travel lanes. This work has been coordinated with westbound Pulaski and the Bayonne Bridge, both of which will remain open during peak periods Saturday and Sunday. This closing is necessary to address high priority and emergent bridge deck repairs in the westbound travel lanes. 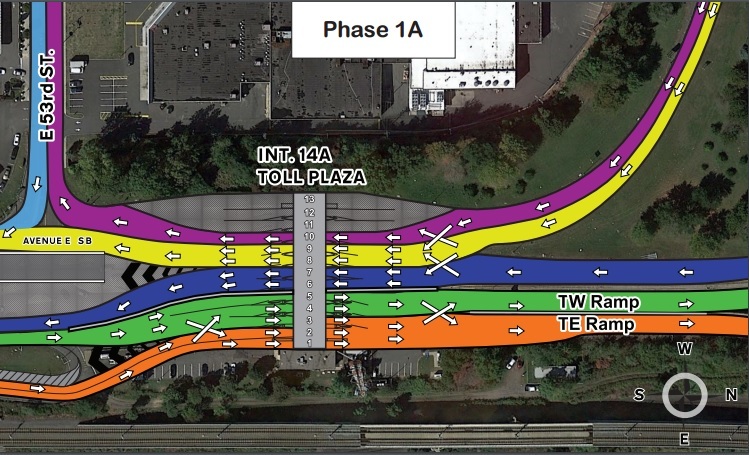 Interchange 14A – A new toll plaza configuration will be installed Friday night. Toll lanes 5,6 & 7 will open and toll lanes 11, 12 & 13 will close for reconstruction. See https://www.njta14a.com/category/traffic/ for upcoming traffic advisories. During the week of 12/02/16, 8:00PM Friday through 4:00PM Saturday, asphalt paving will be performed on the ramp to westbound HCE. During the week of 11/14/16, detours of Pulaski Street will be performed at night, from 8:00PM to 4:00AM, to accommodate new bridge construction. During the weekend of 11/18/16, Toll Lanes 5, 6 and 7 will be reopened and Toll Lanes 11, 12 & 13 will be closed for staged construction. During the week of 11/14/16, asphalt paving will be performed on the ramp to westbound HCE.